Just a few months after shipping their first dual-screen smartphone, the Russian gadget maker Yota Devices is already showing off the new model. The Yotaphone 2 improves upon its predecessor by combining larger and higher resolution screens with a rounded design. Gone is the iPhone-esque slab; it's been replaced by a design more closely resembling the work of Samsung. As has been widely reported, the Yotaphone's claim to fame is a unique pairing of a traditional LED screen and an E-ink screen on a single smartphone. 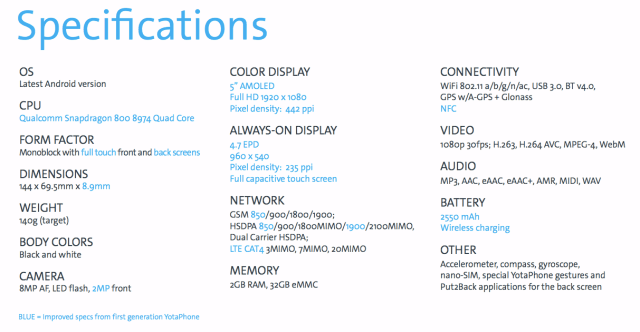 The Yotaphone 2 sports a 5" AMOLED and a 4.7" E-ink screen, both a huge step up from the 4.3" screens on the original. The AMOLED screen has a screen resolution of 1920 x 1080. It's not the sharpest screen on the market but it's up there in the stratosphere. The E-ink screen, on the other hand, has a resolution of 960 x 540. That's a common enough screen geometry for smartphones, and that should make it easier for developers to create and port apps which make use of the Yotaphone's second screen. That's going to be good news for users; there are currently around a dozen apps for the original Yotaphone which make full use of the E-ink screen on the back. The new model also has a full touchscreen on the E-ink side, and not just a small panel below the screen. Yota Devices is also reportedly working on a design with a front-lit E-ink screen, though that isn't on display this week. The new Yotaphone is going to run the latest version of Android on a quad-core SnapDragon 800 CPU with 2GB RAM, 32GB Flash storage, a pair of cameras (8MP and 2MP), and support for Wifi, Bluetooth, and GMS and HSDPA cell networks. 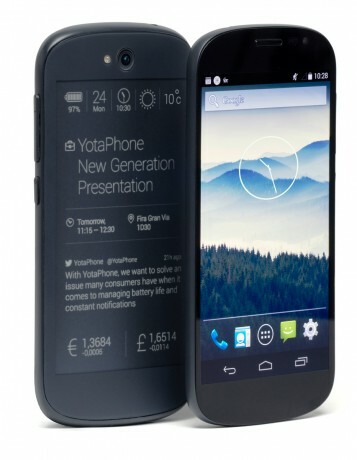 It's hoped that the new Yotaphone will ship in Europe and Asia by the end of 2014. Yota Devices is also working on versions of the device for the US market and for China which they plan to ship by the end of 2014 or the beginning of 2015. The price tag has not been revealed yet but Yota Devices spokespersons have said it will be comparable to premium Android smartphones from the likes of Samsung, HTC and Sony. 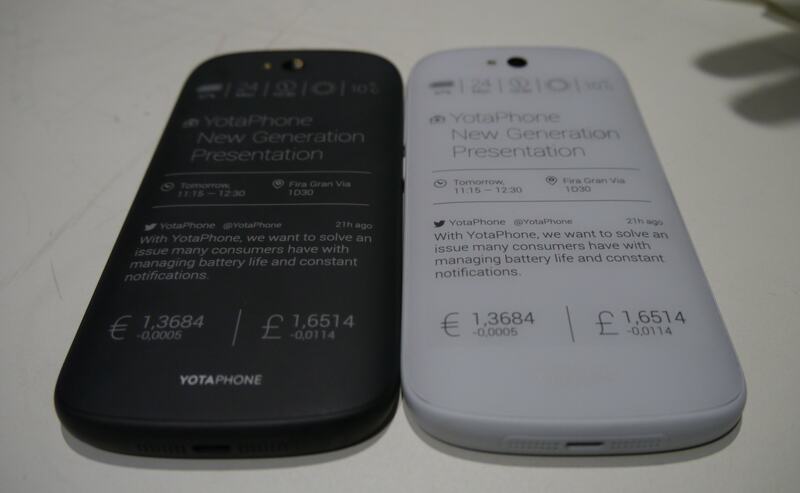 The current model Yotaphone costs 500 euros, and according to earlier press reports around 12 thousand have been sold since it shipped 2 months ago. true, but can you poke in a phone number and text from the e-ink side? Article sez the e-ink side is touchscreen, just not front-lit. Still want. I need a phone I can use during the day.